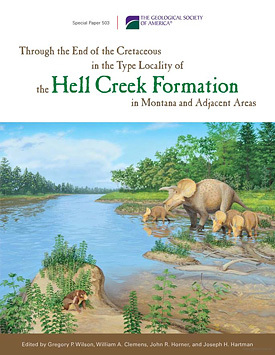 The cover of GSA's Special Paper on the Hell Creek Formation. Image courtesy of the GSA. In January, the Geological Society of America published Special Paper 503, Through the End of the Cretaceous in the Type Locality of the Hell Creek Formation in Montana and Adjacent Areas. Since 1902 when the first skeleton of Tyrannosaurus rex was discovered in the valley of Hell Creek, this area in northeastern Montana has been a focus of research on the evolution of the terrestrial fauna and flora before and after the mass extinction marking the Cretaceous-Paleogene boundary. The new Special Paper is made up of reports of some of the results of "The Hell Creek Project (1999-2010)" that was skillfully organized and maintained by Jack Horner (Museum of the Rockies, MOR). Both in field studies and laboratory research the project involved many students and staff associated with UCMP. Of the fifteen articles in this paper, ten were authored or coauthored by former and current UCMP associates: Nan Arens, Bill Clemens, Mark Goodwin, Pat Holroyd, Howard Hutchison, Anna Thompson, and Greg Wilson. These studies and many of the papers by other contributors make use of the extensive collections of fossil plants and vertebrates in the UCMP collections. For the last several decades paleontologists at UCMP and the Museum of the Rockies in Bozeman, Montana, have collaborated on a wide variety of research and exhibit projects based on fossils found in and around the valley of Hell Creek. In addition to many research publications, an obvious testimony to the successes of these projects is the cast of the skeleton of Tyrannosaurus rex in the atrium in front of the entrance to UCMP. The casts of the individual bones were made at MOR and then assembled into the free-standing skeleton in 1995 shortly before UCMP moved into its current home.